Welcome to my first video blog! I’ve been working on responding to the Woman’s Day Rheumatoid Arthritis article for almost a year. 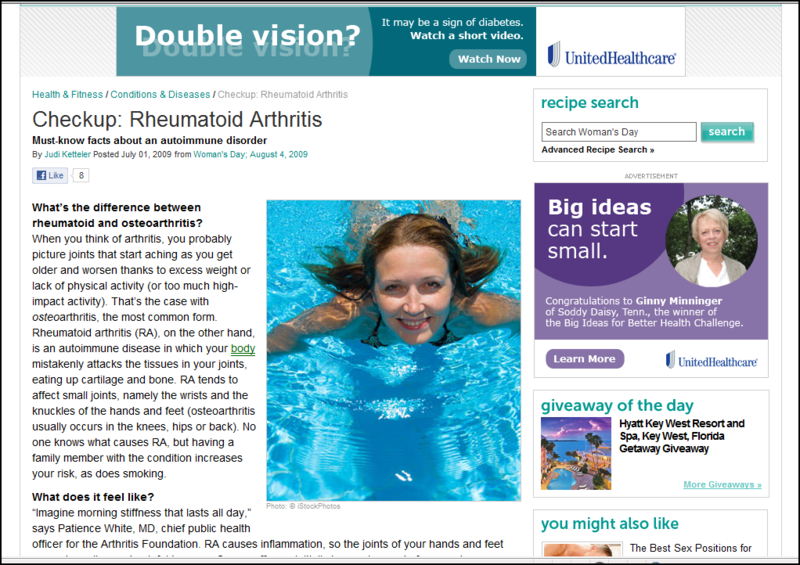 It was my first encounter with the PR (public relations) problem with Rheumatoid Arthritis in the media. 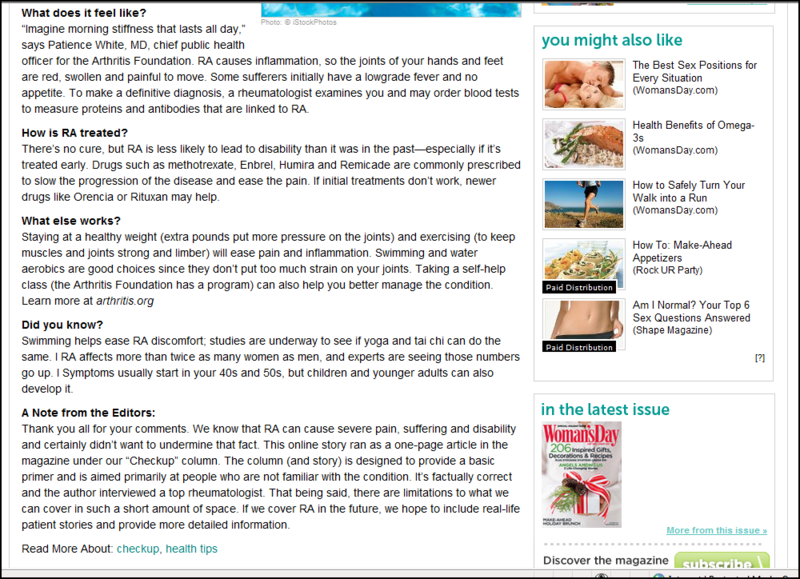 Please read my first blog on the Woman’s Day Rheumatoid Arthritis article here. I’m sure I’ll get better at the technical aspects, but I put my whole heart into this video post. This video is an appeal to Woman’s Day to publish a new article on Rheumatoid Arthritis, using information and interviews from this website, such as The RA Info Button. If you agree with this request, please tell them by writing them a letter or sending them an email or fax. I know it will take your time, but I think this is important. Maybe I’ll do all three in case mine gets lost in the mail. NOTE: Woman’s Day has removed the original article with its non-apology. Below are two screenshots of the original article. There is also a photograph of the print version of that issue of Woman’s Day here – click here. Go Kelly!!! You look lovely by the way! 🙂 Thank you for giving a voice to those of us that suffer. Your video reply was very concise and you were very poised and clear spoken. THANK YOU once again for taking the time, effort, and sacrifice to do this blog. The world is a better place with you in it!! Luv u!! You just come across as such a sweet person, Kelly. I hope this gets the response you’re looking for. aw, I love me some Horton! The video is excellent. You can tell alot of thought and time went into it. I hope Women’s Day will “revisit” RA and will “visit” rawarrior.com. I agree with all the above posts. You did a fantastic job and you are a very beautiful lady. I too hope that Women’s Day will listen. Your right we all need to make the noise. I have thought for several days how cool it would be if one of the national morning shows would have you on to explain what RA really is and I know you would a wonderful job. Thanks for all your dedication. As a man I want to join in with my compliments to Kelly for her brave, intelligent and charming video. Maybe if us guys speak up more we can help dispel the ‘hysterical woman’ concept which the WD article probably feeds e.g. ‘the woman in the pool seems great, what’s wrong with you?’. I remain puzzled why the media presents these cheerful views of RA. Kelly’s blog from March 29th discusses an article titled “The Beachcomber” published in “Arthritis Today” and it was even worse than the WD article I thought. But cheers to Kelly, our articulate, energetic and attractive spokesperson. Thanks for that endorsement Jay! And you know what? You’re right, especially because the Beachcomber thing was published by the Arthritis Foundation. I say yes! Speak up guys! Thank you for a really well done video. What a great job! We need to all fight this and I will be sending my fax,letter and email to WD. Thank you for providing the vehicle to do this so that we may all band together and speak as one. I hope that we will be so loud that they can not ignore this issue and will do another article. Thanks Nikki. We’ve got to be heard this time. Nice video Kelly. I just sent my e-mail to WD. BRAVO! Kelly that was excellent. You did a wonderful job. It is honest, compelling and to the point. Thank you so much for doing it and being our voice. You are the best! I will send an email to them. We need them to take notice and you have started something here that is so important. Thanks Taf. May their mailbox burst! Alice, I know you’ve been through so much w/this disease in such a short time. It is insane the way they portrayed it. I wish they could talk to you – it would change their story. Charge!! Kelly, thank you so much for not just dropping the subject with Woman’s Day. I have personally found the old adage,”the squeaky wheel gets the grease”, to be true (or you can insert the story of Horton – both work)! I thank God for you and for your dedication to informing, supporting, educating, and fighting the cause of RA. My husband and I will both be sending letters asking WD to interview you and publish a more accurate article. That’s awesome Janel. You have a great guy there! loved it and love you ! I have never seen someone pursue a cause with such vigour! Your resilience inspires me Kelly…every single day. P.S. : My mail account is open. I am hitting send to Woman’s Day in next 5 mins. What a GREAT job you did on your video,, as you do on all your posts/information. I have been a fan since being dx last august, and you have inspired me numerous times! Thank you SO much for all that you do. YOU ROCK!! Thank you CJ. Sorry we met from RA, but that is so nice. 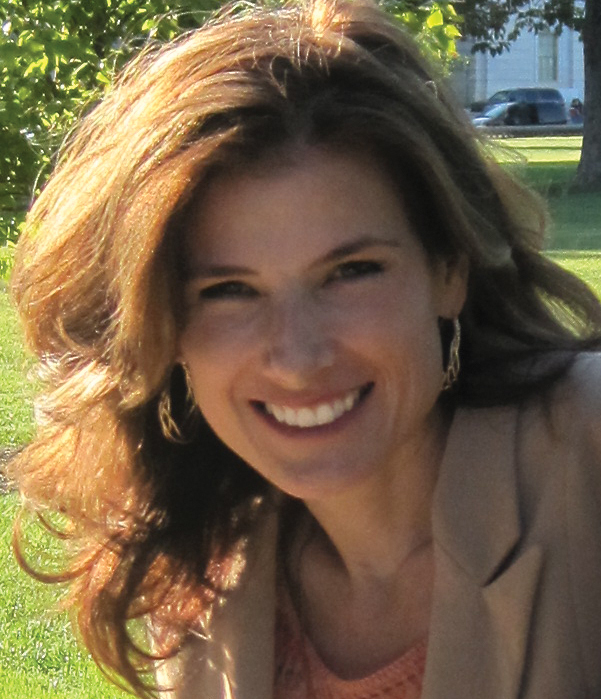 P.S-My husband has RA and I love your website…AMAZING info! Whoo hoo Kelly!! Way to go! That was GREAT!! I am going to e-mail them now!! Thank you for taking a stand for RA and being our “spokes person”! Without you, I know I would be so lost in this “new life” I get to live!!! You have dealt with this disease for so long, but continually for 4 years without 1 day of being painfree. Seeing and hearing you stand up for people all around the world, brought tears to my eyes, and a joy to my heart, that no-one will ever feel alone, and ashamed to say the words “I have RA ‘. I will send an email to WD today, and hope that all the emails and letters that they recieve will be enough to encourage them to interview you and get the real truth out there . Thanks for being a voice for so many. You did a wonderful job and I, for one, thank you from the bottom of my heart. I just sent an e-mail and will get a snail mail note ready to go ASAP. What you are doing is invaluable and greatly appreciated!! Thanks for doing that, Connie. I’m doing the same. Whoohoo! I`m 69 years old and was diagnosed with RA when I was 20.The rollercoaster ride with this monster I know all about. 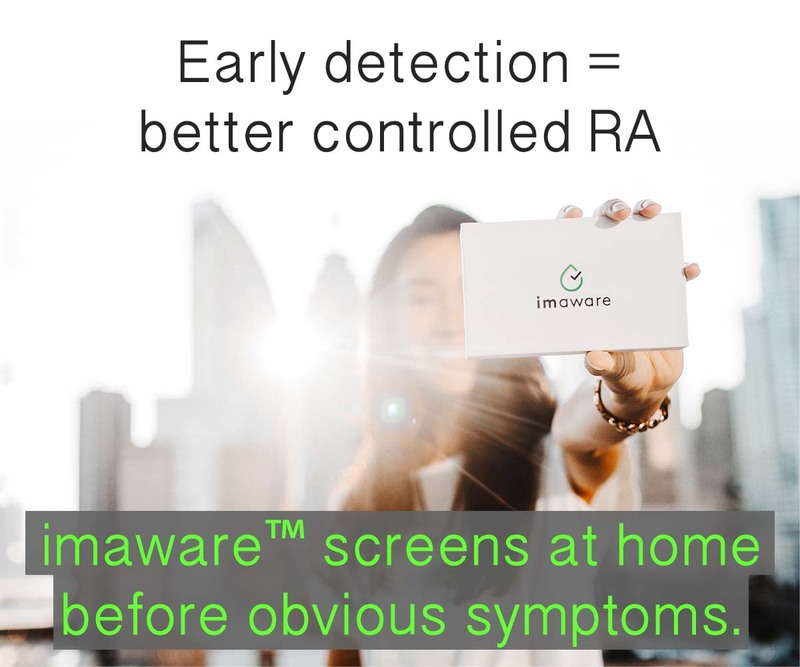 There is a problem with the perception of what RA is about.Arthritis is only one of the symtoms and this desease should have another name to more accurately describe it.You wouldn`t say someone has a headache if they have a brain tumor so let`s stop calling it arthritis because one of the symtoms is joint inflamation. You are right, Frances. I hear that from a lot of patients. I think if patients voted, that would be the end of the “A” word for RA. What would you call it? My daughter can up with a name…she calls it…R.A.D.D..rheumatic autoimmune disease disorder!! !…she tried!! thats what she tells people her mom has now..
Kelly..my daughter Mary says that would be ok with her..she was all happy someone listened to her idea.. Explaining RA is no different from explaining other diseases in that it is simply too complex. Heart disease, Diabetes and Allergies are equally daunting for the average person to understand. I tell people that I have RA which is a blood disease that affects my whole body. Anything else is too much information and is confusing.It may not be measureable all cases but it is definitely carried in our blood. This explanation is enough information for most people that I come into contact with, and serves to get my mother-in-law off my case when she wonders why I take all these drugs! Joanne, you’re right Diabetes is also complex. There have been a lot of public service ads over the years so that most people do know it is a serious disease. Do you think you say “RA” and “blood disease” instead of saying “arthritis” because the A word tells people it’s not something serious, just “arthritis”? Excellent job Kelly! I will certainly take the time to send requests to Woman’s Day. I actually stopped subscribing after their erroneous article on RA. I felt it showed very little research on their part. Thank you for all you do to help people around the world with this disease. God has chosen you for a very special mission. Thank you Natalie. You are so right. It showed no research at all & their reply was minimal. I hope everyone who reads this page will keep writing! This battle is far from over! I’m reminded of what Kelly once said about eating an elephant, you do it 1 bite at a time. I think his trunk is gone!! WOO HOO! Bwhahaha! Laughing so hard here. Yes, I think it is! :rotfl: I’m picking “trunk” from teeth :rotfl: Good one Connie! I have final eye surgery tomorrow to erase the damage of Prednisone, but Hey RA isn’t worth mentioning-at least not TRUTHFULLY HUH?! Nice job on the video, Kelly! I sent my e-mail, which is a big step for my non-confrontational self! And for the record, I like RAD – Rheumatoid Autoimmune Disease. Much better description 🙂 — Thanks, Kim & Mary! I finally got a chance to get my email off. Thanks so much Kelly for being our voice. Now I will follow up with prayer that you will be honored for your effort and they will listen and respond favorably. Great job! I found the article ridiculous. I would rather Women’s Day not have bothered at all rather than spew out a cartoon, ‘dumbed-down version of this devastating illness. The epitome of irresponsible journalism! Prior to this diagnosis, I was one of very few female trial attorneys in my state. Now, less than 7 months later, I’m having a good day if I put on anything that has buttons and snaps, forget practicing law and making a living to pay for enbrel, methotrexate and a whole list of other meds. After reading the Women’s Day article defining Rheumatoid Arthritis, I’m thinking I need to get my money back from all of the doctors, because I obviously don’t have RA, but some other more horrible disease. Keep up the good work! I’d love to sit down and let them interview a ‘real-life’ patient. Did you send your post to WD? BLUE RIBBON CALIBER RESPONSE! Thank you and gentle hugs! Praying for an excellent recovery after your eye surgery. I had to stop taking Plaquenil because of eye problems. Please everyone get checked at least 2x a year if you’re on Plaquenil!! aspect of this horrendous disease (Sjogren’s)—-in the process of a dental implant. I’ll floss for you, (while I still can). I know you’re hurting and I’m praying. I’ve lifted up your affliction today and asked the Lord to take it away. Kelly xxxxx feel better sister! I don’t know how you are making it Al. I think of you a lot. Watching your video brought tears to my eyes, I can’t thank you enough for your fight. You are my hero! Thank you, Bonnie. Thanks for taking time to say that. I hope this will help. you are by far my hero too kelly. you have the fight in you like a warrior, lol like your name. if i hadn’t found you i think i would have gone insane by now. you provide me with answers that a doctor should be giving me. believe it or not i get answers from you more so. you must keep up the fight to get the word out there into the world about just how bad R.A and other related diseases are. I’ve gotten behind in all my reading and haven’t been good about commenting lately…. I’m trying to catch up and just had to say, you did a fantastic job on the video and I was so glad to be able to connect your face with your sweet voice and your words of wisdom and encouragement that you have given to me and to so many others on this site. I sent in my comment to WD last year when that ridiculous article came out. I hope they will listen this time. Thanks, Kelly. You are awesome. Yes, they completely ignored the comments. This time, we’re using real mail / email. Maybe whoever the editors are at the “letter to the editor” will listen more than whoever is the moderator of their web article. Absolutely fabulous Kelly!! I hope that they take your request into serious consideration. We need people to know the truth about the disease and how it effects us and those we love. Thank you for all that you do. You truly are a blessing! Thank you! I cringe when I watch myself squinting w/ no glasses,etc. But I think it was worth it. From what I can tell, they really believe we are exaggerating. My letter to the editor at WD. Please feel free to use this if it helps you compose your reply to this article as well. I am writing today to encourage your publication to take a second look at Rheumatoid Arthritis and the picture that your magazine has painted of those of us suffering with this disease. I believe that we deserve more from you. I believe that you want to do right by your clients, many of whom HAVE RA and are very much offended by your uneducated portrayal of us. I for one will not be purchasing another issue until you have corrected this detrimental mistake. It may not affect you, but it most certainly affects those of us already fighting hard for understanding and doing our best to live well with this disease. Having an invisible disease means that other than our doctors and closest loved ones, no one else really understands or believes the pain that we live with, the deformations that happen to our bodies, the illness caused by being auto-immune and having to take biologic medications that further reduce our immune system. You have made light of us, a joke almost. Realize that now nearly 50 MILLION adults and children are suffering today and crumpling up their last bought issue of your publication in complete disgust of you disregard to us. What a beautiful piece, made me cry… I have been diagnosed with RA as well. I loved to run, workout play with my son and now can barely get out of bed. 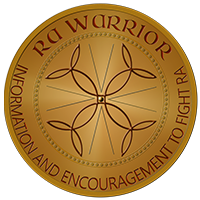 It is a life change that all RA sufferers have to face, each and every day. I love rawarrior, it gives me encouragement to live life to the fullest. Love all you wonderful ppl battling this horrible disease, we will win. I must have been meant to see your lovely post today. I have inflammatory arthritis and went to a rheumy who did treat me aggressively at first. Since my labs never showed enough inflammation, he couldn’t diagnose RA. I was sick with side effects from all drugs, even injectable mtx. During my last exam, he pushed hard on the back of my neck and inside of my knees. When I said that hurt, he said that it must be fibromyalgia! I never went back and it has been almost a year. I am struggling with trying to find someone else and being treated like a hypochondriac! Sorry for the long post! You are so supportive and encouraging! Thanks and blessings to all….